Christophe Bernard graduated as an Engineer in 1984 at the Ecole Centrale Paris, then completed a PhD in Neuroscience at Paris VI University in 1990, did his post-doctoral training at the University of Southampton between 1991-4 and a sabbatical period in 1999-2001 at Baylor College of Medicine (Houston, TX). Since 2001, he’s held the Group Leader position (DR, INSERM) as well as group leader for PhysioNet. He previously was a Reviewing Editor of Science and the Journal of Neuroscience, and is now Editor in Chief of the SfN journal eNeuro. Christophe Bernard was awarded the Michael Prize on epilepsy research in 2007 (most prestigious international prize on epilepsy) and the Felix Innovation Prize in 2013 for the development of a novel organic transistor to record brain activity. His main interest is to understand the mechanisms underlying the construction of an epileptic brain as well as the mechanisms underlying seizure genesis and propagation, focusing on Temporal Lobe Epilepsy (TLE). These research themes are being addressed using a wide array of disciplines, including electron microscopy, morphology, immunohistochemistry, in vitro and in vivo electrophysiology, behavior, mathematics and modeling. Over the years, using experimental models of TLE, our group has developed a solid international reputation, in the field of epilepsy. Find out more at my Research Gate page. Proctor CM, Slézia A, Kaszas A, Ghestem A, Del Agua I, Pappa AM, Bernard C, Williamson A, Malliaras GG. Electrophoretic drug delivery for seizure control. Sci Adv. 2018 Aug 29;4(8):eaau1291. doi: 10.1126/sciadv.aau1291. eCollection 2018 Aug.
Pas J, Rutz AL, Quilichini PP, Slézia A, Ghestem A, Kaszas A, Donahue MJ, Curto VF, O'Connor RP, Bernard C, Williamson A, Malliaras GG. A bilayered PVA/PLGA-bioresorbable shuttle to improve the implantation of flexible neural probes. J Neural Eng. 2018 Aug 22;15(6):065001. doi: 10.1088/1741-2552/aadc1d. Ferraris M, Ghestem A, Vicente AF, Nallet-Khosrofian L, Bernard C, Quilichini PP. The Nucleus Reuniens Controls Long-Range Hippocampo-Prefrontal Gamma Synchronization during Slow Oscillations. J Neurosci. 2018 Mar 21;38(12):3026-3038. doi: 10.1523/JNEUROSCI.3058-17.2018. Frigerio F, Flynn C, Han Y, Lyman K, Lugo JN, Ravizza T, Ghestem A, Pitsch J, Becker A, Anderson AE, Vezzani A, Chetkovich D, Bernard C. Neuroinflammation Alters Integrative Properties of Rat Hippocampal Pyramidal Cells. Mol Neurobiol. 2018 Sep;55(9):7500-7511. doi: 10.1007/s12035-018-0915-1. Horton KK, Segers LS, Nuding SC, O'Connor R, Alencar PA, Davenport PW, Bolser DC, Pitts T, Lindsey BG, Morris KF, Gestreau C. Central Respiration and Mechanical Ventilation in the Gating of Swallow With Breathing. Front Physiol. 2018 Jun 25; 9:785. doi: 10.3389/fphys.2018.00785. eCollection 2018. (1) Understand the fundamental mechanisms underlying the communication between brains regions controlling memory processes. We aim to determine how cortico-thalamo-hippocampal networks exchange information to encode and consolidate. (2) Understand how these physiological rules are modified in different pathological conditions (Epilepsy and Alzheimer). We aim to determine the mechanisms of vulnerability to epilepsy induced by stress as well as the co-morbidities such as depression, cognitive deficits (memory). We use a multi-disciplinary approach in naïve animals (rats and mice), experimental models of epilepsy (pilocarpine and kainite models) and Alzheimer (APPNL-G-F transgenic mice) in which we couple in vivo multisite recordings with silicon probes, behavior and state of the art signal processing. Using mathematical and modeling approaches in close collaboration with the TNG team of V. Jirsa, we are studying the basic mechanisms of seizure genesis and propagation across species. In addition, we also use a whole brain approach with the virtualization of individual mouse brains (The Virtual Mouse Brain) to study structure/function relationships in health and disease. One part of our activity is devoted to design new in vivo recording devices. This is done in close collaboration with Ecole des Mines de St Etienne in Gardanne (Rod O’Connor) and Cambridge University (G. Malliaras). We are experimenting multimodal organic probes, to measure simultaneously electrical signals and any enzymatic activity, as well as electronic pump for the local delivery of drugs to control brain activity. Mesial temporal lobe epilepsies (MTLEs) are refractory to pharmacological treatment. The most effective treatment for these epilepsies remains surgery, which is only effective in 60% of cases. This impasse is partly due to our partial understanding of the epileptogenic network characterizing these epilepsies. Electro-clinical studies provide evidence that these epilepsies are network diseases: The epileptogenic zone is a multi-structural network where the emergence of seizures requires not only the hyperactivity of neuronal populations but also the co-activation (synchronization of the activity) of the different limbic cortexes within the temporal lobe including the hippocampus, amygdala and entorhinal cortex. This led us to develop a research program to determine the structural and functional organization of the limbic neuronal networks, including sub cortical structures responsible of this paroxysmal activities and synchronization in the epilepsies. 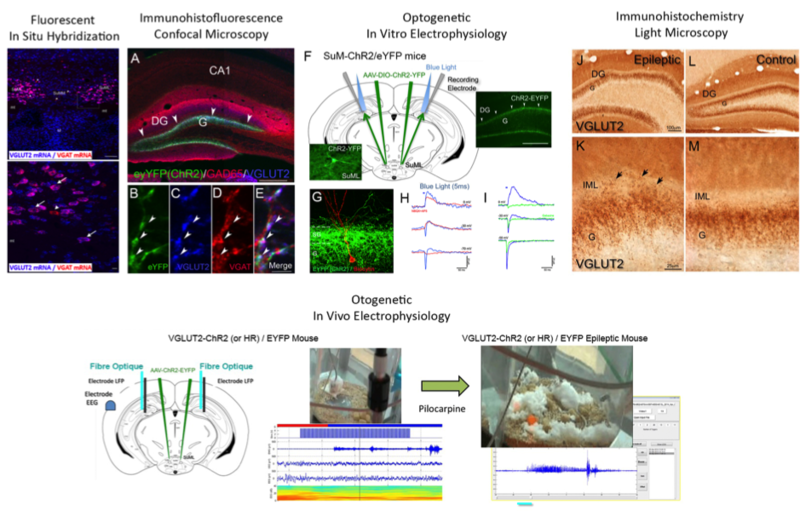 For this research, we combine innovative structural connectivity techniques using neurotropic viral vectors (rabies virus, AAV), neurochemical anatomy (immunohistochemistry, in situ hybridization, tissue clarification) and imaging (light, electron and confocal microscopy) with optogenetic and electrophysiological recording performed in rodent models of MTLE including several strains of transgenic mice as illustrated below. Using a state-of-the-art in vitro preparation, we are investigating the dynamics of brain stem networks involved in respiration, in particular in the context of sudden death in epilepsy (SUDEP). One principal question is how neuronal activity depends on energy metabolism. Many neurodegenerative diseases are characterized by metabolic stress. We suggest that metabolic deficits result in a pathological cycle of events, which contribute to the development of neurodegenerative diseases. A key prediction of our hypothesis is that the strategic compensation of energy deficiency could interrupt this pathological spiral and could provide a rational therapeutic option, which addresses the cause of the neurodegenerative diseases and not just the symptoms. We are also using state-of-the-art tools to control the activity of Cl channels with light, and measure intracellular chloride. We combine advances in neuroscience with advances in engineering to reach goals which neither engineering nor neuroscience could reach alone. Our research is therefore highly cross-disciplinary and boasts: - Neuroscientific expertise, particularly focused on in vivo rodent models of neurodegenerative disease; - Engineering expertise, particularly focused on flexible polymer electronics. We combine our models of neurodegenerative disease with our flexible polymer devices, specifically: 1) to better understand the fundamental neurodegenerative process; 2) to improve the technology used in the treatment of the disease.